Directions - Welcome to Burke Racquet & Swim Club! 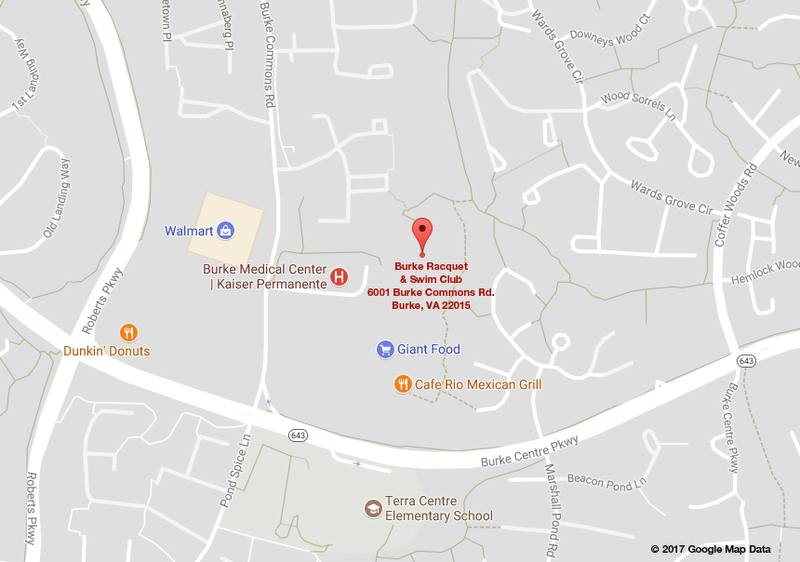 We are located in the heart of Burke Centre, behind the Giant Food shopping center and next to the Kaiser Permanente Building. Click here for Google Map. Take Rt. 123 (Ox Road). Pass George Mason University and Braddock Road intersection (University Mall on left). Go 5 traffic lights to Burke Centre Parkway — turn left. Go to 5th traffic light (just past WalMart, Wendy’s on corner) to Burke Commons Road — turn left. Go to 2nd right turn (at Kaiser Permanente). Go down hill to parking lot. Take Fairfax County Parkway (Rt. 286) south to light at Burke Centre Parkway — turn left. Go to 5th traffic light (just past Wal-Mart, Wendy’s on corner) to Burke Commons Road –turn left. Go to 2nd right turn (at Kaiser Permanente). Go down hill to parking lot. Take Braddock Rd west (Rt. 620). Go approximately 1.7 miles on Braddock Rd. Turn left at the light onto Burke Lake Rd. (Kings Park shopping center at intersection). If you miss this turn, go to the next traffic light and turn left on Rolling Road, then next right onto Burke Lake Rd. Go 2.5 miles and turn right onto Burke Centre Parkway. Go to 2nd traffic light — turn right onto Burke Commons Rd. Go to 2nd right turn (at Kaiser Permanente). Go down hill to parking lot. From I-95 take exit to Rt. 644 west (Old Keene Mill Rd.). Go 5.4 miles to Lee Chapel Rd. Turn right (McDonalds is on right corner). Go through next light at Burke Lake Rd. Lee Chapel becomes Burke Centre Parkway. Go to 2nd traffic light — turn right onto Burke Commons Rd. Go to 2nd right turn (at Kaiser Permanente). Go down hill to parking lot. Take I-95 to exit 160 (Woodbridge/Occoquan) Rt. 123 north towards Occoquan. Stay on Rt. 123 for about 10 miles. Turn right at Lee Chapel Road. Cross Fairfax County Parkway, Old Keene Mill and Burke Lake Road. Lee Chapel becomes Burke Centre Parkway. Go to 2nd traffic light — turn right onto Burke Commons Rd. Go to 2nd right turn (at Kaiser Permanente). Go down hill to parking lot.